I apparently took an unintended summer vacation from the blog, oops. It’s still technically summer, though, and the recent return to high temperatures proves it. It was really weird having such mild weather in August, but it was also rather nice — especially last week, which was sort of like a little fall preview. It was awesome. Of course now it’s back to 90 degrees with 80% humidity, but that’ll only last so long, at least. Went to the first weekend of the fair, ate unhealthy food, and looked at bunnies. Wrote a post for the NaNoWriMo blog; it’ll be up soon! Something else??? I feel like I’m forgetting something. In the yard, the flowers are winding up for the year. The echinacea and rudbeckia are mostly done, which the goldfinches have been appreciating. The yellow rose bush is really big again, but the flowers have mostly been extremely insect-damaged, so it’s not much to look at. The orange rose bush is still tiny, and only has two or three flowers at a time, but they’re still super-pretty when they first bloom. Oh, and the hydrangea actually bloomed! It only had one bloom, but it was a pretty dark pink. I didn’t end up planting sunflowers this year, so the only plant out there for most of the summer was the one I posted a picture of back in April. It got huge, but I’ve been cutting off the blooms once they’re dead and the seeds are mostly gone, so right now it’s not very tall, and just has small flowers. But! There’s a bird feeder outside one of the windows (entertainment for the cats) and it turns out that the birds planted their own sunflowers. There’s four or five plants; I decided to leave them alone and see what would happen. They’re not very tall, because they started so late, but the tallest one has a big pretty bloom on it. And I’m sure the birds will appreciate the seeds regardless! Fall is my favorite season, and my birthday is in a month and a half, so I’m looking forward to the next few months. (Although, to be honest, I have mixed feelings about the birthday.) I’ve been a bit too casual about my business over the summer, so September and October are all about really working hard and getting some new clients lined up — and then in November is NaNo! That’s all for the update! I’ll have a post on Thursday…about the fair, maybe? In my last post I mentioned visiting Louisville Tea Company for a tea tasting. It’s taken me a while, but I am finally posting about it! I completely forgot to take pictures while I was there, so you’re stuck with this after-the-fact photo of the tasting menu and their tea menu. The tasting was a lot of fun. You get to try four different teas in the category you picked, and you get a little menu with info about each one. It was really interesting to taste the differences in the four teas, especially the differences you might not notice if you weren’t trying them one after the other. I liked all four of them and, unsurprisingly, couldn’t pick a favorite. The shop itself was also very cool. All kinds of tea stuff, from mugs and pots to strainers and stirrers, plus some tea-related products and mostly just a lot of really cute stuff. I wanted it all. Particularly everything that came in purple. 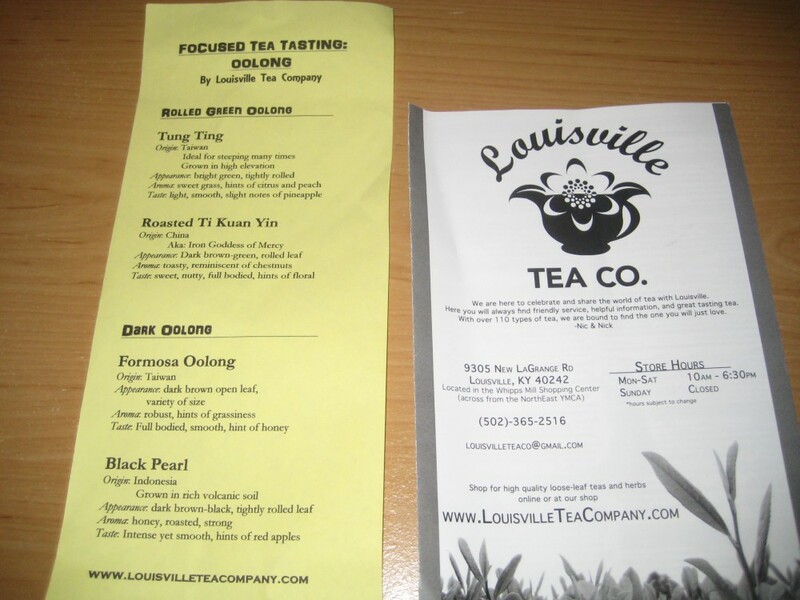 Louisville Tea Co. is at 9305 New LaGrange Road, which is sort of close to Shelbyville Road. They’re open Monday through Saturday from 10 AM to 6:30 PM, and besides the tastings, they offer pots of tea and cups to go, as well as bulk loose leaf teas. You can find more info on the “Visit” page of their site. I’ve recently been on another tea adventure (tea-venture?) to Sisters Tea Parlor in Buckner, where I also mostly forgot to take pictures. I’ll post more about that visit next week.